Eric Vignilé Tindo is a young man from Bohicon, a town about 120 km inland from the Beninese economic capital of Cotonou. Eric was born the eldest son of a family of five children. His father has always worked as a welder while his mother stayed at home. In 2011, Eric gained a professional degree in computer science from the CERCO Institute and, in 2012, he became the Chair of the youth movement in his hometown, the ‘Mouvement des Jeunes Pour la Relève de Demain’. The movement was originally created to support the re-election of the incumbent Mayor of Bohicon, Luc Atrokpo, who is also the National Executive Secretary of the ‘La Renaissance du Bénin’ political party. The general and municipal elections however, originally planned for 2013, only took place in 2015; during the two years prior to the elections, Eric became very active for the party. Yet, in his view, lacked all fundamental knowledge of democracy. In early 2015, Eric joined the NIMD-AWEPA School of Politics, a programme set up to provide training sessions for young Beninese people in response to the country’s needs and political culture. “Eric has become one of our most dedicated students.” Jerome Scheltens, Programme Manager. The School of Politcs class of 2015. Benin has seen some substantial economic growth in recent years but the effect on poverty reduction and development has been small. The country is still one of the poorest in the world. Following the adoption of multiparty democracy in 1990, presidential transfer of power has taken place peacefully multiple times, respecting the maximum term limits and based on what are considered to be sufficiently free and fair elections. However, although the country is considered to have a stable governance system, issues of severe corruption have led to increased social tensions resulting in strikes and demonstrations. Democratic reform has also been stagnant for a long time; as a very conservative political culture, Benin prefers to uphold the status quo. Therefore, politics in Benin is exclusive and belongs to a small political elite. Policies and legislation rarely purposefully reflect the opinions of a broad section of the population, and youth and women in particular are excluded from participating in policy-making and political leadership. Because of this, there is very little trust or even interest in politics and governance. 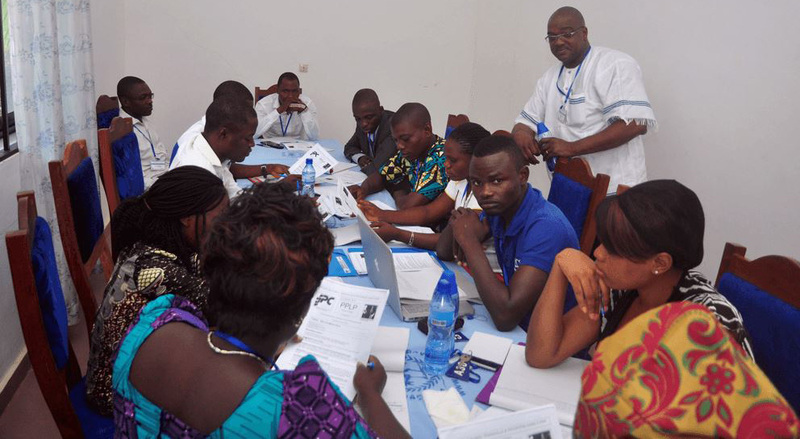 In 2015, NIMD and AWEPA initiated their first School of Politics in Benin, with the specific goal of promoting the role of youth and young women as democratic and civic orientated political leaders to help address their exclusion from politics. For the first cohort, NIMD and AWEPA identified a group of 34 high-potential politically and civically active youth – 11 women and 23 men from across the country, all hoping for a brighter future for their country. The goal was twofold. Firstly, the School of Politics trains engaged young students, including Eric, in democratic values and culture during weekend retreats in Ouidah, a town just west of Cotonou. Secondly, the school supports its alumni network to organize activities aimed at influencing internal party policy and political decision-making, to make them more open and accommodating to the needs of youth and young women. During the first session in early 2015, Eric and the other students received training to improve their understanding of political systems and help them develop skills as political strategists. The students learned how to write party programmes and manifestos, and develop strategic plans. They also picked up the skills needed to maintain a political position, including for example public speaking. Immediately after this first session, Eric got to work putting his new skills into practice. He wrote a campaign plan and political programme for the Mayor of his hometown. The Mayor then put him in charge of communications and youth mobilization for the municipality during the 2015 elections. And so, Eric was able to focus on organising youth activities promoting democratic values such as post-election polls and door-to-door campaigns. Although, at first, many party members failed to understand the importance of including youth in more positive roles in politics, a change in behaviour by some of the youth leaders themselves, along with a healthy dose of perseverance from Eric, seems to have started to have their effect on the old guard attitudes towards youth participation. A subsequent School of Politics session later in 2015 focused on election processes and management. The students were trained in the importance of transparency and accountability during elections. Among other things, they developed skills in election observation, results management and drawing up an electoral Code of Conduct. 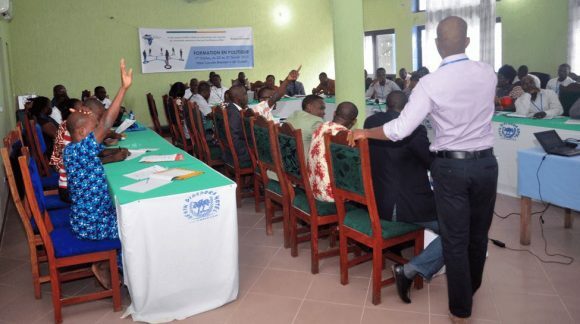 After impressing the Secretary General with his knowledge, Eric was put in charge of selecting and preparing party poll representatives and representatives of the candidates at the community and district levels. 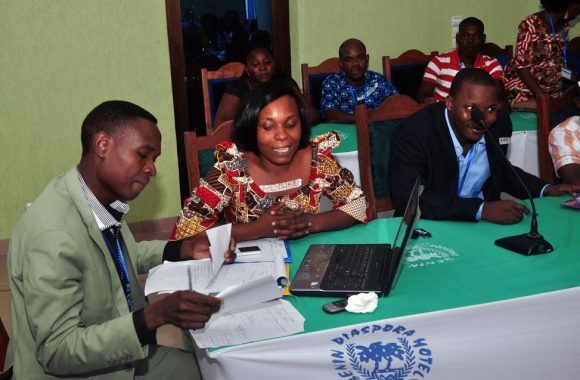 With the support of one of his classmates Véronique Tonoukouen, he used the training skills he had acquired at the School to prepare the party representatives for election observation during the municipal and parliamentary elections. He used this opportunity to explain the electoral code to the observers, demonstrate its importance and show how to abide by it. He did his best to stress the idea that election observation is about more than stopping another party from cheating but about the legitimacy of the process. On this topic, Véronique noted that “Even if only one or two people are better equipped to observe the elections in a non-partisan way, we have made progress”. As part of the alumni network activities, the programme supported Eric to organise feedback sessions to share what he had learnt within his youth movement, including what the youth wing should be doing better. Not all members of the youth leadership were willing to accept the changes Eric pushed for; while he wanted the leadership to be more representative of the community, some members felt they would lose their hold on power. However, according to Eric, the leadership of the movement has changed a bit over time. As they now see the political value of representing their community, they organise outreach activities and have established a working group to give the leadership space to discuss thematic topics and learn from each other. “The youth leadership even pays its membership fees these days” Eric says proudly. It’s not perfect and the group still faces many challenges not least regarding its own capacity, but Eric points out that even little things can help when he notes his own ability to engage in real debate instead of shouting during discussions, which he feels has really improved the quality of his interactions. Participants of the School of Politics engage in dialogue. Eric speaks fondly of his classmates from a range of political parties and civil society backgrounds, and is the first to admit that the School has changed his view of women in politics after having seen how smart and dedicated the women in his class are. Over the course of the last year and a half, Eric has become a great believer in democracy and, even though he is the first to dedicate the career he now has within the party to the Schools programme, along the way he has managed to transfer so much of what he has learnt to his community and party. In the process, he has contributed to building a more democratic political culture that is open to the participation of young people and women, and a political system that supports transparent and legitimate elections. Not least, Eric has contributed to changing the way his party works from the inside, making it a more responsive and inclusive political organisation that he and other party members are proud of. 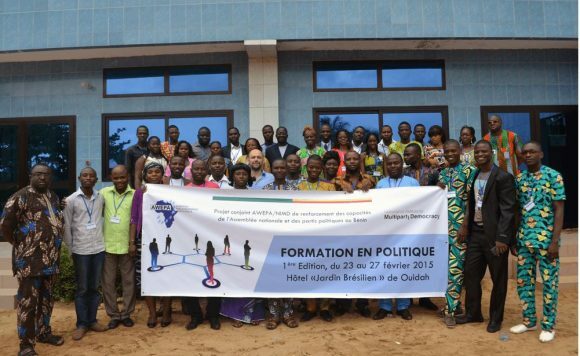 Together with AWEPA, NIMD continues to promote inclusive democracy among political and civic youth in Benin. It is currently working to improve the content of the School training sessions, as well as promoting the inclusion of representatives to cover the full local political scope, so that more people like Eric are empowered to become the democratic leaders of the future.